I make no bones about it. I dedicate this to my awesome and beautiful partner, Audrey. A gush fest? I wouldn’t say so. More a few words about gratitude and how re-opening your heart can lead to unexpected joy. So welcome to a clearer view of the ground ahead. Clearer? Yep, I’d say so. I’m lucky, I’ve had a lot of love in my life. The road has been a bit bumpy but, I’d say I’ve been lucky. Of course, the love I get from Ben and Liv has been remarkable. I know we always say that about our family but they have been there for me – in the good times, and we are blessed to have had many, and the not so good. We have, of course, welcomed Gaby to into the family and for that I am grateful. We have our wonderful family and friends. To quote the Beatles again ‘love, love love’. But, for this blog, I want to look at unconditional love, as I see it through the eyes of The Wee One aka Audrey. I am so fortunate to have Audrey in my life and to have such a beautiful soul as part of #TeamDurky. This isn’t some declaration of love. I do that every day anyway. But, I guess, in celebrating the wonder of The Wee One, it’s a chance for us all to look and to rejoice when we find someone who is our true partner in life. When looking at the definition of unconditional love, I see so much in there about Audrey. First one ‘Appreciating someone else for who they truly are’. Liv describes Audrey as being pure. I know what she means, but wouldn’t it be wonderful to see the world in a way where you appreciate the people around you for who they are, not for what they can do to better you? Does that make sense? To be able to see the good in someone. To be able to enjoy the good and to enhance it by being such a good person as well. But it’s not just about being able to appreciate someone else for who they truly are, it’s about appreciating the moment for what it is. And it’s being so excited about something, no matter what it is, where you tip tap your fingers with pure excitement. It’s infectious this happy excitedness thing (and that’s not even a word!). Next up – ‘It means loving them when they are unlovable, and in spite of their imperfections and mistakes’. Now, some might find this a sure but, at times, I’m a grumpy old bu66er. I know, I cover it up really well. Sometimes, I drive and rant. I think it’s called road rage. There are occasions when I sulk. YES, SULK!!!! And, throughout it all, there is no judgement; no criticism; no ignoring. Just love, pure love, and a hug. Magic. And then – ‘Never, ever questioning whether you’ll feel any other way toward a person’. Isn’t it nice to feel so comfortable in a relationship where you just know. It’s that simple. I hope I’m making sense here, and I hope you can reflect on your own relationship and feel the same. It is magic – to have finally arrived at this place. As I said earlier, I’ve been lucky in life I have had love there. But, now, I am so grateful to have unconditional love looking right at me. I hope, over time, I learn to be the mirror reflection. I know what I feel, but I also know I have a lot to learn from The Wee One. And there you have it. A short but sweet blog. Just like the subject. Thank you Audrey. The Retro Lady will soon take centre stage for a rather special birthday. The next part of our awesome journey together. And, so we step from the View From The Ground into a great big dollop of lemon meringue pie. A few weeks away from the keyboard has whetted the appetite in more ways that one. The zest to share ideas has slowly risen. The energy has been whisked into a light but fluffy frenzy. Thank you for joining me at my perch, to have a look at what is on my mind. So, lemon meringue pie for your soul? What? Well, it’s a bit of a long story but that will become apparent as I walk you through my mind state. However, as I muster the creative will to commit to this damned book I continually bang on about, I have been searching for the kind of title that might appeal to a casual reader. Well, I may just have it ………… with a series of titles afterwards, such as ‘Practical Mindfulness with fudge cake and cream’. Work in progress. It’s a funny old world. When I heard that Donald Trump wanted a new career, my euphoria was short lived when I realised my mis-spelling. Then I heard that Kim Jong-un had just topped trump. Bizarre world. The World Cup is just around the corner, and within days of it starting most of us will be round the bend due to the abject boredom after waiting 4 years since the last bout of abject boredom. Mad Vlad will put in (think about it) his profound thoughts on its success, as he wrestles with the idea of what a Trump and Jong-un baby would look like. Ladies and gentlemen, let me introduce you to Boris Johnson. Anyway, that’s enough rambling. Or is it? I know I’ve written this year about our memory jar – an awesome present from Ben and Gaby – but the more we fill it with memories the more I’ve truly appreciated the magic of those memories. As they say memories are made of this and, as I say, thank goodness for the memories. It’s simple – create a memory; lock it into your mind, write it down, take loads of pictures, write a blog, whatever. But do it! Let’s start creating memories. I know since I’ve started on this path of creating as many memories as possible, I really appreciate the moment in which that memory is being created. It could be something small – but, it isn’t small really. Because it’s what you are creating. Does that make sense? I guess, expanding the point, if the chance to create a memory presents itself – take it. Plunge into the ‘live for the moment’ ocean and enjoy your chance to seize the opportunity. Create it, bank it, cherish it. If you let the moment pass you might regret it. It might be something as simple as a spur of the moment chance to do something when you would normally do your housework. The choice is simple. But how many times have we said “I’d love to but ………..”? Don’t look into your memory jar of life and see loads of blank pieces of paper because you let the chance to create a memory slip. I know I’m blessed and I have plenty of memories already in the 2018 jar. I know we have things lined up to create more memories. When I need reminders of the memories, the house is now full of photos, framed concert tickets and tour posters, and other such things to keep us all focussed on how lucky we are. These memories are not reliant on money – good job! They are reliant on seizing the moment and loving every minute of it. Lemon meringue pie for your soul? Just think about it. How many of us see Lemon meringue pie and are immediately transformed back to a happy childhood? A Sunday afternoon tea treat? Or something to feast on at a cafe at a nearby seaside town? I’m positive further opportunities will come along, some unexpected, and it’s just a case of being ready and willing to take them. So, again, the View From The Ground fades until the next blog. As Vera warbled, who knows where who knows when. However, my finally moment from the blog comes from taking a moment to listen. I was recently recommended a book – Solve For Happy: Engineer Your Path to Joy by Mo Gawdat. I’ve only just started the book, so I’m sure there will be references to it in a future blog. But I like to look into who the author is. In doing so, I became aware that he was started a crusade – #onebillionhappy (www.onebillionhappy.org). The objective is clear – make one billion people happy and then watch the impact and see how that grows. Interestingly, this has already grown from the original objective of .#10millionhappy as planned in the book introduction. Step 1: Make happiness your first priority and recognise that happiness is your birthright. Step 2: Invest in your happiness (reading Solve for Happy is a good starting point). Step 3: Tell two people about the message that you have learned, who will tell two people, who will tell two people. Now the challenge is, on the basis that this blog will be read by at least 2 people (me and Audrey) for us the tell 2 people about #onebillionhappy. We owe it to the world – in my humble opinion. Or, as the song goes, ‘oh I do like to be beside the seaside, oh I do love to be beside the sea …..’. Welcome back to the View From The Ground. It’s been a while since my taxi drive up in Aberdeen. I await receipt of the book recommended by my friendly driver – ‘The Mind is Flat: The Illusion of Mental Depth and The Improvised Mind’ by Nick Chater. I suspect it will be a reference point for future writing. All things mind related fascinate me, so the idea of reading someone’s take on what he terms as the illusion of mental depth should be thought provoking. The illusion of mental depth? Are we who we think we are, or are we what we have created to be the person we want people to think we are. Interesting? How many people do we know change because they want to be ‘free’ of what or who the world wants them to be? But, in fact, they create a persona that they think is the person society doesn’t want them to be but, in fact, it is just that – a persona not the person. Deep? As deep as the sea. Si! A lot of times we build the person we are, almost as a protection from things or people that have hurt us. Again, just thinking about it, how many times has a life event caused someone to build themselves into the person they think they need to be to be able to deal with what they fear might happen again. Deep as the si (sic). The mind is a wonderful thing to explore. But, who has the answers to how the mind work? Who can unlock why we are who we are? Why we act the way we do? And, let’s just stop right there and think about the phrase – ‘act the way we do’. ‘Act’. The definition of ‘act’ – as a verb – ‘behave in the way specified‘; as a noun – ‘a pretence’. So, do we change the question to ‘why do we behave in the way specified’? Or, ‘why do we perform a pretence’? Why are we being the person we think we should be? We are right back at the start of this one man debate. And, notice – in that last question I used ‘perform’ and ‘pretence’. I suspect I will be tossing and turning this debate in my mind for some time. Trying to, I guess, work out who I am, why I am, and is that what I am meant to be – or can / should I change and, if so, would that change be to a better version of who I think I am. Try applying the above to yourself. I hope it makes enough sense for you to give it a go. One of my favourite sights, sounds and smells is the sea. It is a blessing to be able to enjoy all three senses and recently Audrey and I had a brief chance to enjoy a walk in the sun, on the beach, next to the sea. That experience brought memories flooding back about the sea – holidays, fun, relaxation / meditation, moments of mindfulness, all sea related. Just think of the therapeutic beauties that the sea holds. Just to see the sea, this force of nature. To watch the waves lapping on the shore and then drifting back, only to be replaced by another and another and another wave. The calm and then the crash. Hypnotic at the very least. If only we could all live close to the sea. I’m not tempting a Day After Tomorrow scenario, just thinking about how magnificent it would be to be able to ‘just be’ for a set time every day. To sit, or stand, or lie, and watch the sea. 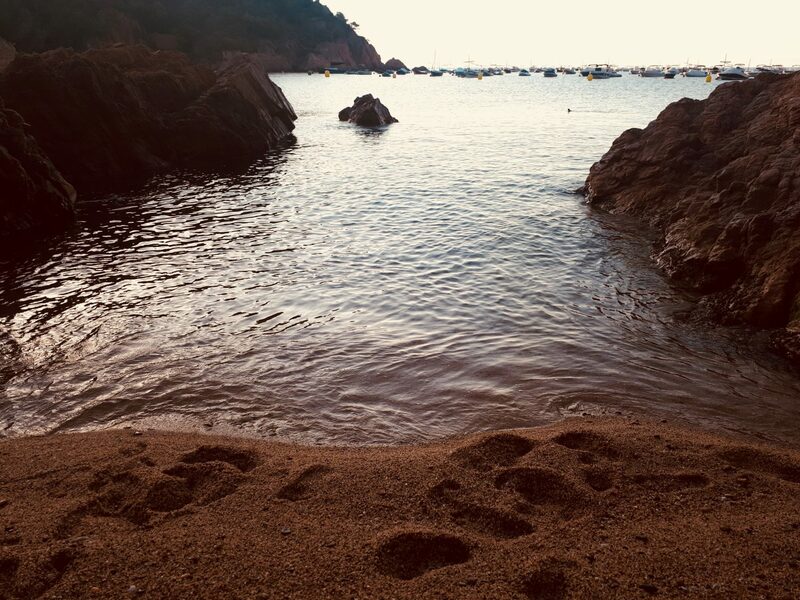 There’s a small cove that I love to visit when we are lucky enough to holiday in Catalonia. It’s beautiful and has featured as the picture for a previous blog. But, at times, when life events are just a bit tough, I picture myself back there – at night, staring up at the dark sky with its beautiful tapestry of bright, gleaming diamond like stars; with the sound of the sea, gently lapping onto the pebbled shore. It’s probably the most beautiful, therapeutic image I have. The sea holds such power and, of course, has the ability to cause disaster. But, then, many things that create such hypnotic mindsets are equally dangerous. Think about the beauty of watch flames dance on an open fire or on a bonfire. Yet, then, the abject cruelty that fire can bring when unleashed is mind numbing. The sea, for me, is my paradise. My go to – either physically or in my mind – to create a place of peace, of happiness, and of calm. Just the thought, as I write, of lying on a towel, with the sun beaming it’s warming smile down, listening to the roll of my friend, the sea, creeping along then wet sand, and then sliding back from whence it came – just beautiful. The best meditative state I can create. The key to the door towards the creation of perfect peace. And so, like the rolling waves of the sea, I will slide back into my normality – and work on whether the person I think am is the person I am. It’s going to be a bit of a ride as I work The the countless possibilities. But, if it gets a bit confusing, I’ll just have do what I can to see the sea. Si! Until the next time, when ever that maybe, I wish all readers who have followed the View From The Ground peace and happiness. The words that are published are just the thought tumbling from the random mind of a middle aged grump. At no time are they intended to offend or disturb. Take care out there. It’s raining!